Every year a new generation of Santa’s reindeer are born — thousands of them. They are born in the spring and they spend the first several months of their lives living high in the mountains of the beautiful countries of Norway, Finland, Austria, Germany, Chile, Peru, Canada and the United States on special ranches operated by Santa, Elf Victor and a special team of elves trained in raising reindeer. Not every reindeer can fly and not all flying reindeer actually come to the North Pole. Elf Victor and his team work to identify those special athletes that can work in the service of Santa and hundreds of them make their way to the North Pole every November and December. 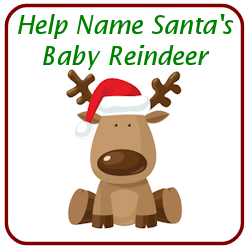 Before they get there, each needs to have a name and only Santa names them. But Santa wants help with this job — YOUR help. There are hundreds of baby girls and baby boys that need to be named. Can you think of a good name or two? Is your name a boy name or girl name?